Picture - A side view of the Woomera CA-4 prototype, A23-1001. The CAC Woomera, also known as the CAC CA-4 and CAC CA-11, was an Australian bomber aircraft, which was designed and manufactured by the Commonwealth Aircraft Corporation during World War II. The order for the Woomera was cancelled before it became operational with the Royal Australian Air Force (RAAF). In early 1939, the Australian Government ordered large numbers of Bristol Beaufort bombers, to be built in railway workshops, and in doing so, by-passed the local aircraft company, Commonwealth Aircraft Corporation. CAC, under Sir Lawrence Wackett, began work on its own design, hoping to out-perform the Beaufort by building a machine that could serve as both a torpedo bomber and dive bomber. To keep down weight, Wackett dispensed with traditional self sealing fuel tanks and opted to make the wing cavities liquid-tight, and thus serve as fuel storage. The Australian Government was initially uninterested in the CAC design. 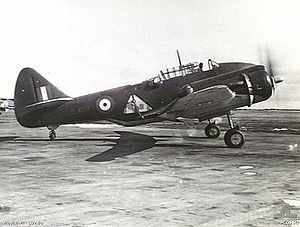 However, in mid-1940, cut off from the supply of British-made components for the Beaufort program (thanks to a British embargo on the export of aviation products, due to the need to maximise British production during the Battle of Britain), the Australian Government ordered a prototype of the CAC design, even before the Royal Australian Air Force had expressed a view about the machine. This prototype CA-4 took to the air on September 19, 1941. The CA-4 was a low wing, twin-engined, multi-role bomber with a crew of three. It was armed with four nose-mounted .303 calibre machine guns and two remote-controlled twin machine-gun barbettes mounted at the rear of the engine nacelles. It could carry either 500 lb (230 kg) bombs, 250 lb (110 kg) bombs or two torpedoes. It was originally powered by two Pratt & Whitney Twin Wasp R-1830-S3C3-G radials. Unfortunately, the novel fuel tanks never proved reliable, and in January 1943 the CA-4 prototype was completely destroyed in a mid-air explosion, probably due to a fuel leak. With a re-designed tail and rudder, and an improved nose armament of two 20 mm cannon and two .303 calibre machine guns, the CA-4 became the CA-11 Woomera. Faced with the crisis caused by the Japanese entry into the war in December 1941, the RAAF accepted the design even before testing was complete, and ordered 105 examples of the CAC bomber on March 8, 1942. However, after the loss of the first CA4 prototype, the redesigned CA-11 did not fly until June 1944. By the time production was due to commence, the dive-bombing concept had fallen into disrepute, the RAAF was filling the light bomber/reconnaissance/strike role with British-designed Bristol Beaufighters (which were being made in Australia by the Department of Aircraft Production); US-made B-24 Liberator heavy bombers had also become available. Consequently, the original Woomera order was reduced from 105 to 20. After the first CA11 flew, the whole program was cancelled and the production capacity set aside for Woomeras at CAC was switched to P-51 Mustang fighters. 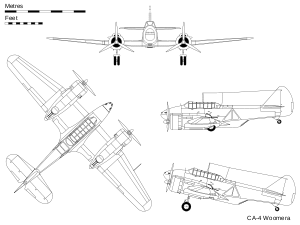 Picture - Orthographic projection of the CA-4 Woomera - the first prototype. Green, William. War Planes of the Second World War: Bombers and Reconnaissance Aircraft, Volume Seven. London: Macdonald, 1967. ISBN 0-356-01477-0.